Nickelodeon now has two Swatties on staff, Claire Sumaydeng-Bryan ’10 and Andy Smith ’01. But now a serious effort to revitalize Main Street is under way. The cultural hub of the effort is the relocation and expansion of the state’s only nonprofit art-house movie theater, the Nickelodeon. It’s an ambitious, multimillion-dollar project that’s being overseen by Nickelodeon executive director Andy Smith ’01. Smith was born in Columbia, but it wasn’t film that brought him back to South Carolina. It was politics. He credits a postcollege conversation he had with Mark Lotto ’00 (now an editor at GQ magazine), in which Smith defended his vote for Ralph Nader in the 2000 presidential election. “It was one of those rare conversations in that Mark actually made me change my mind and see the wisdom of working within the Democratic Party,” Smith says. In 2005, Smith returned to Columbia as the deputy manager of Robert Barber’s lieutenant governor campaign. Barber is the proprietor of a popular oyster shack outside Charleston, but he’s also a Democrat, which made his chances for holding statewide office in South Carolina dim. Barber fell to the Republican incumbent by a mere 3,000 votes. 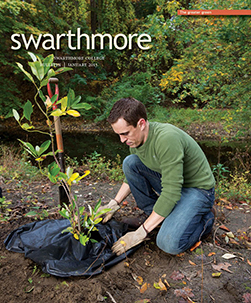 Afterward, Smith returned to his academic roots. Having majored in film studies at Swarthmore, he received a master’s in film, television, and digital media from the University of California–Los Angeles. He was hired to start an independent film festival, now called Indie Grits, at the Nickelodeon. His responsibilities expanded, and when the longtime executive director of the Nick stepped down in early 2012, Smith became his successor. 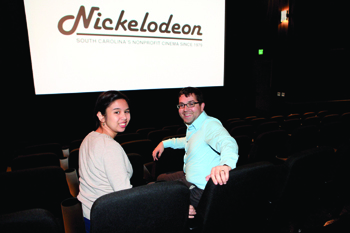 The Nickelodeon was founded in 1979 by two University of South Carolina media-arts students, and it’s become a treasured cultural institution. But in recent years, the theater, which was located a block south of the Statehouse, seemed outdated. For one, it occupied a cramped, one-theater space, with creaky, uncomfortable chairs. Also, by the time most independent films arrived at the Nick, they were already available on DVD to watch at home. Not so at the new space. With the help of the city and a prominent entrepreneurial family with a next-door business on Main Street, the Nickelodeon bought the former Fox Theatre in 2005 for $6,000. But it would cost much more to renovate the space, which had closed in 1986. The Nick raised $3 million to complete the first floor—a state-of-the art 99-seat stadium-style theater, a spacious lobby, and staff offices, which opened to the public on Aug. 31. In the next two years, Smith hopes to raise another $2 million to open a 200-seat theater on the top floor. He’s also hired an experienced film buyer who steers films to the Nick soon after their openings in New York or Los Angeles, and he recently brought on board Claire Sumaydeng-Bryan ’10 as a development assistant. Perhaps even more significant is the cultural mark Smith hopes to make. For years, the overwhelming demographic that attended the Nickelodeon could fairly be described as white baby boomers whose car radios are perpetually tuned to National Public Radio. “It’s not that our primary programming has changed a whole bunch, but we’ve added late-night and special programming like the Indy Grits, which adds a different dynamic, ” Smith says. Soon, the Nickelodeon will begin after-school media-studies programs for students at local predominantly African-American, underperforming high schools. “The hope is that we’ll get these kids as freshmen, and they’ll stay with us, and we can help them get into college,” Smith says.